I’m a big fan of children’s literature and since one hasn’t been reviewed on here before I thought now was a good time to bring it up. I chose this children’s book to review first because there are several things about it that called out to me before I even read the pages between the covers. To list them: 1) Lemony Snicket 2) Jon Klassen and 3) The Dark; to elaborate, I really enjoyed “Lemony Snicket’s” style of writing and when I saw the book come in waiting to be put on the shelves at work, I was wondering how it would work for a book “catered” to a younger audience (at my work we shelve it in the 3-5 age range). I’m a huge fan of Jon Klassen’s illustrations and a quick glance through the book was enough to make me fall in love with his work all over again. The Dark. As a child (And shhh. don’t tell anyone, even as an adult) the dark scares me. No matter what age, I was sure that it would be relatable. The story is short and simple and the ending really sweet. I wasn’t sure what to expect but I’m happy my curiosity compelled me to pick it up. The story is about not being afraid of the dark. I wouldn’t expect anything less from Snicket’s style by giving the Dark a voice. It was a little creepy at first because I’m a scaredy-cat and in my mind I wanted to tell Laszlo not to listen to it but, he’s a brave child. More than myself. Seriously… I wouldn’t have left my room. All in all. I definitely recommend this book! I know I put my employee recommends sticker all over every copy we had in store haha. 5 out of 5 for me! Give it a go if you find it at your local bookstore! Have you read this? Did you love it as much as I did? Do you read children’s literature? What’s your favourite? 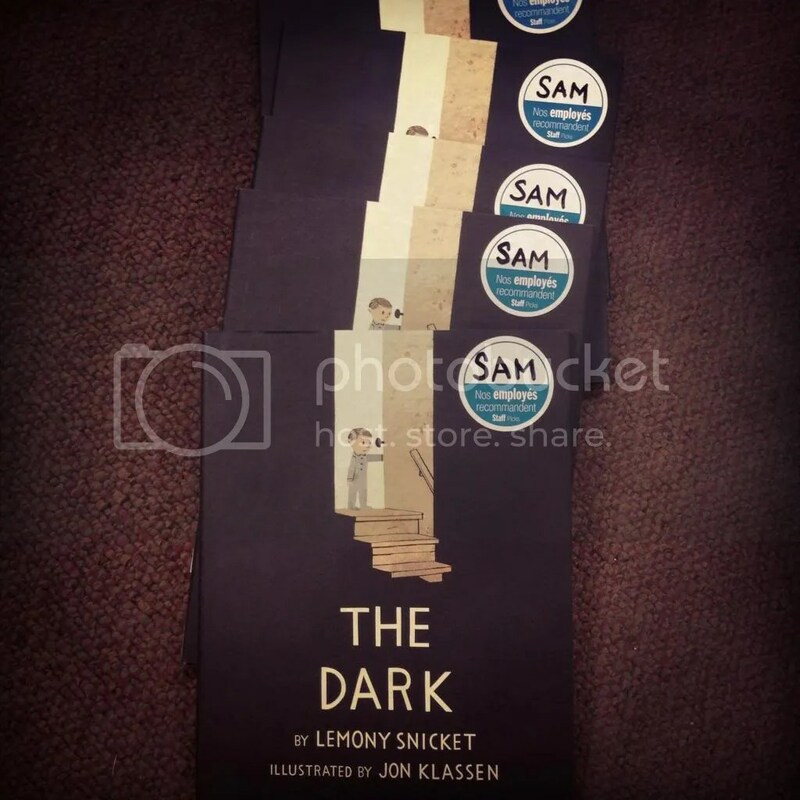 This entry was posted in 2013, Reviews and tagged Book Blog, Book Reviews, Books, Children's Lit, Jon Klassen, Lemony Snicket, Sam, The Dark by dreamingwithink. Bookmark the permalink.